Select from any of our 40+ IP locations around the world to maximize your speed and connectivity. New locations added frequently and we always welcome new location requests. Use SafeIP VPN on your PC, Mac, Linux operating systems, tablic PC, and even your iPhone or Android smartphone. Download the free SafeIP VPN app for your Android phone for easy setup and access. Sites like Facebook, YouTube, Gmail, Twitter, and thousands of others are blocked by many schools, universities, offices, ISPs, or even countries. Even most of Google's services were blocked by China. SafeIP can be used to unblock any website, bypassing filters and firewalls, allowing for a free Internet. SafeIP uses anti-blocking measures to prevent the software itself from being blocked by any Internet Service Provider. Use SafeIP to access any site on the Internet, even if it is blocked by your country, ISP, workplace, school, or local network. Prevent any kind of Internet censorship. 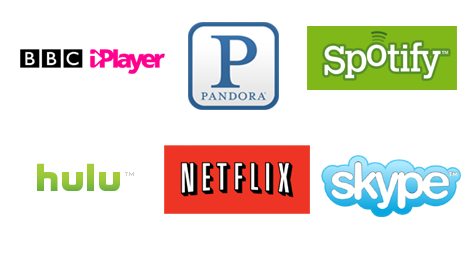 Some websites like Netflix, Hulu, and Pandora only allow access if you are located in a specific country. Change your IP country location to access to such sites from anywhere in the world by hiding your true location. Knowing your online privacy is maintained is priceless. Internet connection records containing personal information are collected and stored of from billions of Internet users around the world every day. Even with information is collected legally, it could inadvertently fall into the wrong hands and be used for tracking your online behavior, stealing your payment information, identity, or malicious purposes. SafeIP can be used for free to protect your Internet connection from such threats by concealing your location securing your Internet connection. Create encrypted connection between your PC or Internet device and our secure IP network to prevent your ISP and government from logging or monitoring your Internet usage activity. We use only the strongest form of OpenVPN protocol encryption. Using WiFi hotspots to get online is risky, even if they are password protected. Anyone near your wireless network can intercept your Internet traffic and could possibly view your private information such as account names, passwords, bank account numbers. Your IP address can reveal many details about you such as your location programs you use, sites you have visited, and may even be linked to your physical address. Your IP address can be seen by any website or Internet service you use. By concealing your real IP, your online anonimity and privacy is assued.